Dundee has paid tribute to ten of the city's most inspirational men and women. Remembered: Discovery Walk honours those who made contributions to the city. Forgotten pioneers have found a permanent place in its future of Dundee at the centre of its waterfront development. Discovery Walk was opened in the newly created Slessor Gardens on Wednesday, paying tribute to ten of the city's most inspirational men and women. Now immortalised in bronze, each of the ten people made huge contributions to their fields of science, social justice and even comic books. 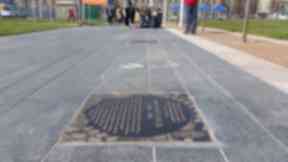 Biologist D'Arcy Thompson, Mary Lily Walker, the mother of social work in the city, and creator of comic legends The Broons and Oor Wullie, R D Low have all taken their place in the newly created walk. The other people honoured in the walk are Mary Ann Baxter, Margaret Fairlie, James F Riley, James Alfred Ewing, Geoffrey Dutton, Walter Spear and Peter Le Comber. More than 100 descendants, colleagues and friends were at the ceremony to officially unveil their memorial plaques. Australian Kelly Marr came up with the idea and teamed up with artist Suzanne Scott to turn her vision to reality. She said: "It is wonderful to see so many people come together. I had a vision of the relatives and colleagues being able to get as close to the plaques as possible so having them unveil the walk was perfect." Lord provost Bob Duncan said he was delighted to open the walk in Slessor Gardens, which was named after Mary Slessor, at the heart of the waterfront development. He said: "All these people lived in Dundee, came from Dundee of have been connected with Dundee so it is great that so many people came from around the world to see them honoured. We really are inspiring the world and these people have inspired the past." Kenneth Low, nephew of RD Low said: "It is a great honour. I think he deserves it. He put the comics of Dundee on the map. All of the Lows are really proud. "Today I met relatives I never knew I had. It has been a wonderful day for all of us." It is hoped Discovery Walk could be extended all the way around the public space and commemorate even more famous people from Dundee's past. Slessor Gardens has yet to open to the public while the grass beds. It is expected to be officially opened in the summer.